ANN ARBOR, Mich.—Come spring, a line of 20,000 yellow daffodils will run as far as the eye can see in the University of Michigan's Nichols Arboretum. This thread of "Marieke," a narcissi yellow trumpet daffodil, is the work of artist Susan Skarsgard who hopes the serpentine display will inspire contemplation on the idea of lines, borders and the definitions that people impose. Skarsgard, a master of fine arts candidate in U-M's School of Art & Design, says this line, titled "Imagine/Align," is an extension of her work as an artist, a calligrapher and as a designer for General Motors Corp. To make the project possible, Skarsgard recruited more than 150 volunteers from the U-M and Ann Arbor communities to plant the 10,000 bulbs that will produce 20,000 blooms in the spring. "This is the first time I've created a piece of art where I've had to rely on the help of others," Skarsgard said. And she admits that there are a lot of aspects of the project over which she has no control, including the weather. But it was something else over which she had no control that spurred Skarsgard to this project—walls. She is disturbed by the use of walls to separate people, walls such as that being constructed in Israel and the former Berlin Wall that divided a country and its citizens. 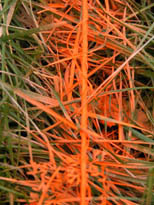 Using a string and spray paint to mark the line through the Arboretum, a trenching machine then cut the designated path, making little or no impact on the environment. 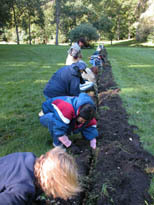 Volunteers dropped the bulbs into the 6-inch to 7-inch deep, half-mile trench. Once covered, the artist and others have only to wait for their emergence in late April, an emergence that will announce that spring has arrived in Southeast Michigan and give rise to thoughts on walls. The waiting for the blooming time will be a period when the title "Imagine/Align" takes on even more meaning. There will be an opening celebration when the flowers bloom. The artist is interested in the reactions of people who come to see the "yellow line." Does the line represent division, a community of flowers? Does it denote keeping in or keeping out? Documentation of the process of this project is available at http://www.imagine-align.org where numerous and timely updates will appear. Skarsgard plans to continue her documentation for the next 20 years observing and interpreting changes in the line. If you are interested in contributing to the support of this project, please visit the sponsor page of the website, or email imagine-align@umich.edu for more information.